Are you a single Mom who wants it ALL? You want to start a business, raise happy and healthy kids, AND have a life? You can! Watch my recent Mom&Daughters Inc video interview with Kaywanda Lamb. 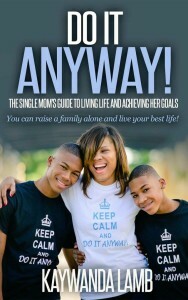 She is a Mom, new Author, and Social Media wiz. But most importantly, she is an entrepreneur who believes you can have it all. If you’ve got a plan! She shared some specific advice of how she balances it all including some great tips on how she grew her social media fan base and how she juggled family while earning her Masters degrees. I think this advice applies to all Mothers who want to live a full life and grow their business. Looking for tips on how to grow your social media fan base? Pay special attention to @Kaydma’s answer at 6:20 min mark. She shared some great tips on how to get started building a following. Interested in buying her first book? Want more advice? Visit her website and recently published ebook at www.kaywandalamb.com. You can also head over to her Facebook page for updates. Share with me in the comments that quote that stands out as your fav!